The reason for this feature is two-fold: First, the statistics feature is an excellent way to use the experience of other Bondora investors as a benchmark for your success. A Bondora portfolio is vastly different from conventional investment portfolios which carry stocks and bonds. Therefore the normal industry benchmarks don’t apply. 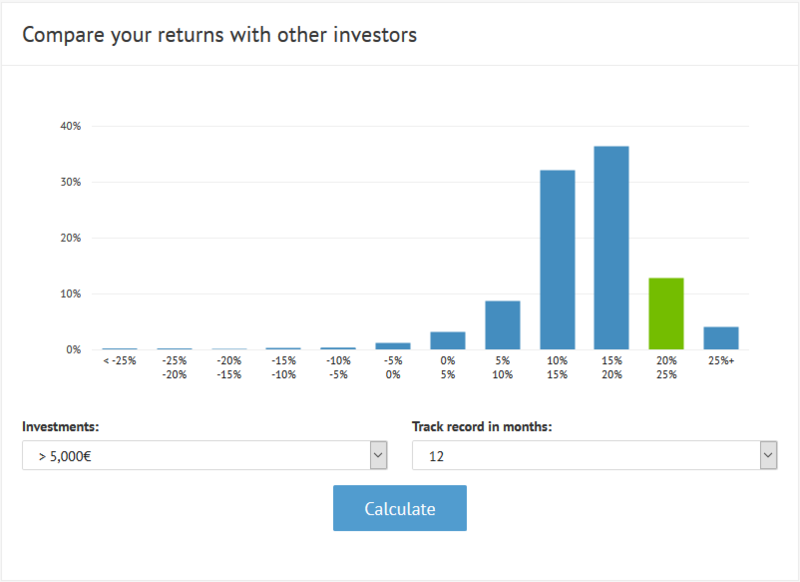 Use this panel to determine what rate of return is in line with the average Bondora investor. Second, potential investors can use the tool to get an idea of where the concentration of returns are for various invested sums. This information is helpful in deciding whether to invest with Bondora and in what amount. Users can choose incremental sums (>1,000€; >3,000€; >5,000€; >10,000€) while also choosing a period (3, 6, 12, 24, 36 months). You’ll notice for example that across all periods the greatest concentration of returns falls in the 15-20% range. Investors can get a broad overview of total portfolio returns across all periods and amounts by leaving both fields blank. This setting shows that the greatest concentration of investors (26.9% as of 10.11.2016) earn between 15-20%. This corresponds to the total Bondora annualized net return of 16.5% posted on the top of our statistics page. In our next posts in this series we’ll review the other calculations available of the statistics page.